Kieran Cartharn Columbus City Council Candidate Defends Vape Shops (Published by The Vaping Post) Written by Tony Ottomanelli II – Who Are The Vapers? Mr. Cartharn makes a great point here. He is referring to the fact that vapor products were included in the new law to raise the smoking age in the city of Columbus. In the City of Columbus, Ohio, the 7 Democratic City Council members, where in some case these members were appointed and not elected, all voted unanimously to raise the smoking age to 21. Of course, since the FDA defines vapor products as tobacco products rather than harm reduction devices, unfortunately whenever the smoking age is raised, this will always include vapor products. This means the one successful thing people have been using to quit smoking are relentlessly connected to cigarettes in a way that defines them as being the same thing, when in fact, we now know, these two separate things share only one important connection. That connection is important because vapor products essentially save lives and those who smoke can use these vaping products to quit smoking and face a much less harmful outcome. Furthermore, why is vaping being perceived as the same thing as smoking? We already know, it’s all about the money and it’s so obvious that vaping has the potential to make smoking obsolete. So, we are unfortunately faced with attacks on the industry from every angle. Columbus, OH is a very valuable city in reference to consumerism in America — so many new consumer products are sent straight to Columbus in order to judge their success rates and also observe the effects on business. Applying such restrictions could damage their chances of remaining as one of the first metropolitan areas to sample the goods. Why would cities such as Columbus deprive their residents, the chance to purchase vaping products as an alternative to cigarettes? All this does is push potential consumers away from the opportunity to quit smoking. Where is the logic in that? Well, business is business unfortunately. Then again, such actions taken by City Council members, reveals a lack of concern for their own citizens. It’s refreshing to see a candidate stick up for small businesses like Kieran Cartharn is doing. Kieran is probably the most impressive 20 year-old individual I’ve had the pleasure of speaking with. Simply from hearing him speak about the issues surrounding his community is a very rewarding and meaningful experience. Mr. Cartharn does not speak like most others who campaign for election. Kieran Cartharn tells me, by passionately declaring, “You can’t come into anyone’s life and tell them what they can and cannot do. Enough is enough.” Amen to that! In my own personal assessment, Mr. Cartharn is one of the brightest shining lights in all of the current American Political spectrum’s dim-lit glory. This is someone who we need rising up the ranks of the political hierarchy. His position on issues is very matter-of-fact and genuine, in other words, he is not fake like most others in a similar situation. Hearing testimony from a real local resident, who is also a small business owner, is certainly a sign of reassurance that there is something special happening in Columbus — the dawn of a new type of political candidate has been born and is quickly evolving in the state of Ohio’s capital city. Kieran Cartharn is the real deal and anyone who knows the benefits of vapor products should support this man in his efforts to better his community and most likely bettering more communities in the future, because I do not see Mr. Cartharn going away anytime soon. Win or lose, his position in politics will only rise higher up from here. Cartharn explained, “it’s time that we start being honest with one another and it’s also time for someone to start telling it to the people how it really is.” Campaigning as a Republican, if elected, he would be the only member of the entire City Council who would not be a Democrat. City Council Candidate Kieran Cartharn is very vocal about his support for local businesses, specifically defending Vape Shops. 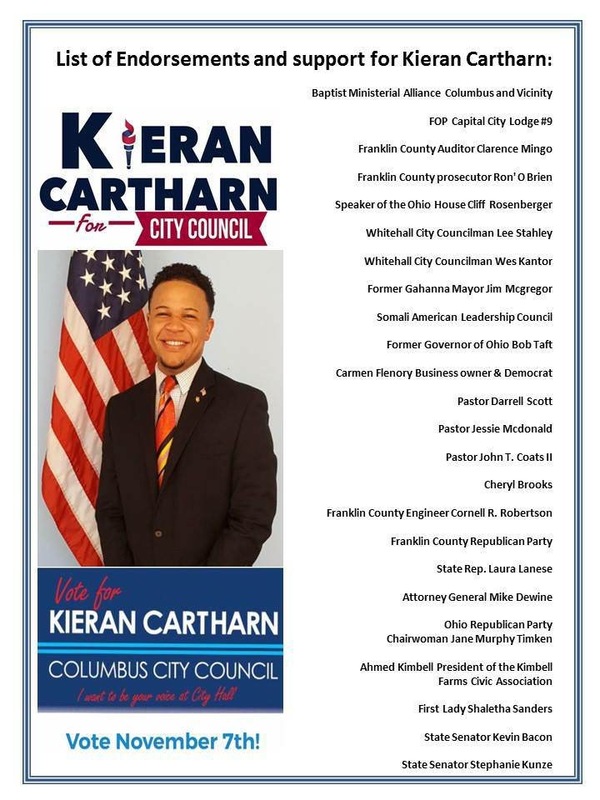 Kieran Cartharn is already endorsed by individuals and organizations in the state of Ohio with some very impressive credentials. There is Speaker of the Ohio House Cliff Rosenberger, Ohio Attorney General Mike Dewine, Ohio Republican Party Chairwoman Jane Murphy, Senator Bacon, Senator Kunze, a number of prominent Pastors, the Franklin County Prosecutor & the Franklin County Auditor as well as the Former Governor Bob Taft. Election Day is November 7th so if you reside in Columbus, Ohio then perhaps the only practical decision to make is to vote for Kieran Cartharn, it seems to be the only logical choice. He has already won the Primary Election, now help him win the General Election.